This is one seriously delicious cheeseburger inspired by the flavors of the Southwest, personal favorites of mine. A luscious, gooey queso sauce made with Monterey Jack cheese takes the place of sliced cheese and makes a secure bed for roasted and diced poblano chiles. 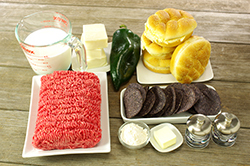 Blue corn tortilla chips give the burger an unexpectedly perfect touch of salty crunch. The queso sauce would also be wonderful as a dip for chips or fries. 2. 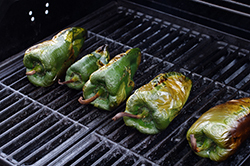 Put the chile on a rimmed baking sheet, rub with 1 tablespoon of the oil, and season with salt and pepper. Roast in the oven until the skin of the chile is blackened, about 15 minutes. Remove the chile from the oven, place in a bowl, cover with plastic wrap, and let the chile steam for 15 minutes. Peel, stem, and seed the chile and then coarsely chop it. 3. To make the queso sauce, melt the butter in a small saucepan over medium heat. 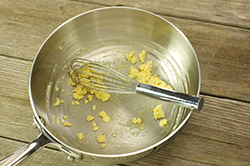 Whisk in the flour and cook for 1 minute. Add the milk, increase the heat to high, and cook, whisking constantly, until slightly thickened, about 5 minutes. 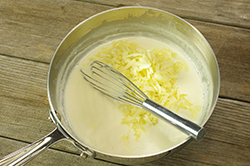 Remove from the heat and whisk in the cheese until melted; season with salt and pepper. Keep warm. 4. Divide the meat into 4 equal portions (about 6 ounces each). Form each portion loosely into a 3/4-inch-thick burger and make a deep depression in the center with your thumb. Season both sides of each burger with salt and pepper. 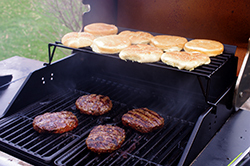 Cook the burgers, using the remaining 1-1/2 tablespoons oil [on the meat surfaces]. 5. 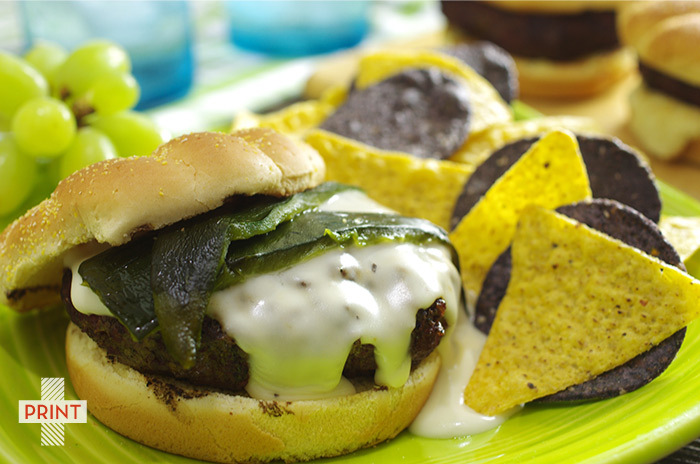 Place the burgers on the bun bottoms and top each with a few tablespoons of queso sauce, chips, and some of the poblano. Cover with the bun tops and serve immediately.